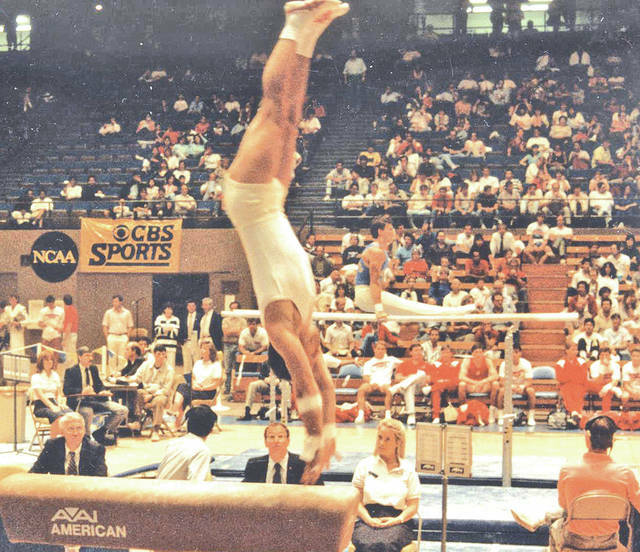 Mike Willson springs off the vault horse during his collegiate career at Ohio State. Editor’s Note – The is the fourth in a series of four stories featuring the 2018 inductees into The Times-Gazette Highland County Athletic Hall of Fame. The inductees will be honored, along with 41 high school senior scholar-athletes, at a banquet scheduled for 6 p.m. Thursday, June 21 at the Ponderosa Banquet Center in Hillsboro. The public can reserve tickets for the event by calling 937-402-2522. Mike Willson did not have a lot of athletic success in Highland County. But it was during his school days in Hillsboro that he received enough encouragement to keep trying, and he parlayed that advice and a relentless work ethic into becoming an eight-time national champion collegiate gymnastics coach. When he was a freshman at HHS, Willson said he read a book about the late Jack LaLanne, often referred to as the “Godfather of Fitness,” and that was the impetus for Willson running home from school at lunchtime every day to do pushups and pullups. Another time in those formative years he received more inspiration from another coach that lived near St. Mary Catholic Church in Hillsboro. At Hillsboro, Willson played played basketball, baseball and ran a little track. Then he headed to Ohio State University where he had to work several part-time jobs to pay for his tuition, meals and expenses. One day when he was taking a break from his studies he walked into a room and thought the circus had come to town. What he was looking at was an OSU gymnastics practice, and what he had no way of knowing was that he was staring straight into his future. Before it was over Willson had coached teams to seven junior college national championships, one Division I NCAA National Championship at Ohio State, and four national runners-up. He coached 85 national junior college All-Americans, three Big Ten championship teams, and was on the U.S. Olympic Committee from 1968-72. Before all that, he was an OSU gymnast, competing on the rings, parallel bars, and vault, and was captain of the 1958 OSU gymnastics team. Eventually, he landed a job at the University of Buffalo where he taught anatomy, health education, a camping class, among other classes, and coached a bunch of guys who worked out in the gym a lot. “I always tried to find the least dramatic way to solve a problem,” Willson said. It was communicating with his athletes and his love of competition, Wilson said, that led them to believe in him. After five years at Buffalo, Willson was told that he needed to start working at a summer camp, but for no additional pay. So he started sending his resume all over the country. He was eventually contacted by Odessa College in Odessa, Texas, where the movie “Friday Night Lights” was filmed. Odessa was dropping its football program and starting a men’s gymnastic team. Odessa offered him triple ($12,000 a year) what he was making, a car, to pay all his moving expenses and gave him and his family a place to live for a few months, plus another $1,000 to help raise money for the athletic program in the summer. His first team at Odessa went 18-6 and won the Texas collegiate championship. The next year they were national junior college runners-up, then the next seven consecutive years they won the junior college national championship. In 10 years at Ohio State, Willson’s teams went 142-32, won Big Ten Conference championships in 1983, 1985 and 1987, and a national championship in 1985. They placed in the top ten at the NCAAs nine consecutive years. Willson produced two individual NCAA event winners, 24 NCAA All-Americans, five NCAA Academic All-Americans, an Olympian, and 40 Big Ten Scholar Athletes. In his 23-year coaching career his teams went 411-53. He received 13 Coach of the Year awards, served as vice president of the U.S. Gymnastics Federation, and as a U.S. coach for tours of Russia, Bulgaria, Canada and Cuba. He is a member of the Junior College Gymnastics Hall of Fame. He said he taught his athletes how to work hard, push themselves, set a goal, and attain that goal. After his coaching career ended at Ohio State in the late 1970s, Willson became a high school principal and worked in three different school districts until retiring in 2004. Today, he said he plays golf three times a week, and completes an intense workout three to four times a week. “I had a great career,” he said. “I never planned anything except when I came out of high school I was gonna be a basketball and baseball coach. None of that worked out. https://www.timesgazette.com/wp-content/uploads/sites/33/2018/06/web1_Willson-pic.jpgMike Willson springs off the vault horse during his collegiate career at Ohio State.